Mom has been here for a few days, which means we’ve been having feast- like dinners. As she knows how we are busy, she prepares wonderful dishes before I’m back from work. She went to Ankara (capital of Turkey) yesterday morning to visit her sister and turned back before evening. When I came back from school, I entered the kitchen first and opened the refrigerator to see what we had for dinner and guess what? There was a surprise waiting for me: These walnut rolls for my sweet tooth! And she also took these photos for my blog. Combine all the ingredients for the dough well. And make a soft dough. Cover it with a wet piece of cloth and rest itfor about 40 minutes. Divide it into four balls. Roll each of them out. They shouldn’t be so thick. Try to make them as thin as you can. Sprinkle the crumbled walnut on them evenly. Roll them up and cut them like coins. Preheat the oven at 180C and cook it until they get golden. Meanwhile you can prepare the syrup. Put sugar and water in a pot and stir until the sugar melts. When it boils, add lemon juice and boil for a few minutes more until it gets thicker. Then wait it until cold. Take the walnut rolls out of the oven and pour the warm syrup on them when they are still hot. Wait them in this syrup and serve cold. Preheat the oven at 370F and cook it until they get golden. Those little rolls look very simple to make. My mouth is watering right now just to think on them coming out of the oven. It was so nice of your mom to even take the pictures. Please do thank her for such an easy and well documented recipe. These are amazing looking, delightful pastries! Oh your mom is a great baker and a great photographer too, the rolls are gorgeous and the photos beautiful :o) Can you send her over here :)? Hey Zerrin, I love walnuts, and even more turkish and eastern desserts soaked in sweet syrups-yum. Oh, and your Mom took photos for your blog? Sweet…. MaryMoh- These are wonderful at any time of the day with tea. You can have these even with a scoop of ice cream. Anncoo- You’re right. I learn a lot from her. Sophie- Thank you! I ate quite a lot from these. They were wonderful! 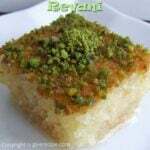 Erkin- These can be eaten at any time if you love desserts with this syrup. The best point is that it’s so easy to make. Oyster- Although most people here don’t prefer eating such desserts at breakfast, I think such kind of desserts make great breakfast. There are various desserts with this syrup in Turkish cuisine and we call them ‘dessert with syrup/sherbet’ (şerbetli tatlı). This one is one of the easiest. Hope you love it when you try. Jenn- You’re right, they make perfect snacks for me. I occasionally enter the kitchen to have some even after eating a lot. I’m afraid I’m gaining weight. Reeni- Thank you! I’m sure we will try some new (for me) dishes together. Vanessa- I’m absolutely so lucky. It’s great to see delicious dishes when back from work. These look amazing! You are so lucky to have your mom there cooking for you! What a lovely treat Zerrin! Enjoy the visit with your Mom! This is a delicious treat. Perfect for snack or dessert. I’m interested in the lemon syrup. I bet it give a nice tart flavor. I hope you have a wonderful time with your mother, Zerrin! She looks like a fabulous cook and photographer…I will definitely be making these delicious rolls! Perfect recipe to be savoured after a couple of glasses of Rakı when one needs something sweet! Brussels calling!! 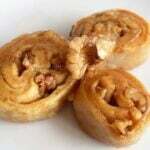 Your apart & lovely walnut rolls look so marvellous & apart!!! Totally agree with Mary. Your Mum is a great baker. Sweet rolls like this are some of my favorites, and I cannot wait to try your version, I love the lemon syrup on top, perfect breakfast treat! Perfect for my afternoon tea. Looks delicious. I wonder if anyone can resist these. Thanks for sharing.